These 12 case studies were collected as part of putting together a joint donor document on Integrating Water, Sanitation, and Hygiene into Nutrition Policies and Programmes, which will soon be published by UNICEF, USAID, and the World Health Organization. In selecting these case studies, priority was given to activities that achieved measurable nutrition-related impact. They are grouped under four broad headings according to basic program goals. At the end of the case studies we have also included a collection of 10 shorter program briefs or “snapshots.” These highlight the diversity of contexts in which WASH and nutrition can be integrated, and the wide array of donors, ministries, and NGOs that have recognized the benefits of doing so. These two large-scale programs both focused on reducing stunting among poor, largely rural populations through child nutrition. In Honduras, activities (which received Title II funding) included support for food security as well as improved local water systems. 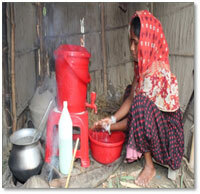 In Bangladesh, a pilot program that is now being scaled up promoted appropriate hygiene behaviors as part of improved infant and young child feeding practices (IYCF) by introducing hand washing stations in the kitchen. Programs in Bangladesh, Peru, and Ethiopia were designed to combine (and in the case of Bangladesh individually test) multiple-sector “program arms” in an integrated way to improve child nutrition. 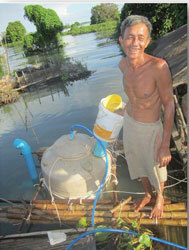 All three programs included both WASH and health inputs in addition to nutrition. Women and girls’ empowerment was also an important factor (and found to have a strong independent effect on stunting in Ethiopia). Early child development was a major program arm in the Peru case study. The Sahel regional program encompassed development of a framework to define, incorporate, and track a WASH “minimum package” at both facility and community levels as part of nutrition programming during a humanitarian emergency. The Mauritania case study shows how this framework was carried out in a country context. In the Democratic Republic of Congo (DRC), faith-based organizations joined together to empower communities, including displaced populations following a humanitarian crisis, to improve malnutrition rates through a multi-sector approach including WASH. These four programs focused on designing approaches for special populations (floating villages in Cambodia), special problems (poisoning due to “konzo” in the DRC), or special program platforms (distribution of commodities by community agents and use of incentives to improve use of antenatal care and delivery services in Kenya). They demonstrate that the role for innovation in combining WASH and nutrition to improve development impact is virtually unlimited.